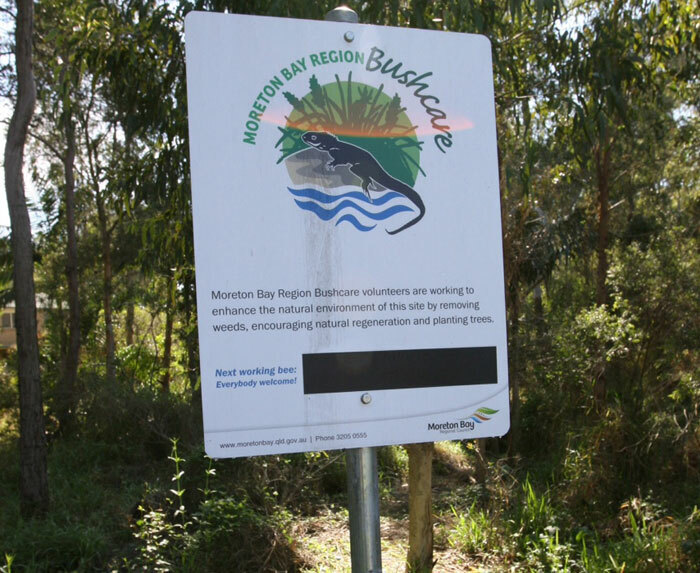 If you enter the Reserve from the south-eastern end of Fred Campbell Drive, you’ll see the Dawn Road Reserve Bushcare sign, which will be updated with the next time and place to gather. 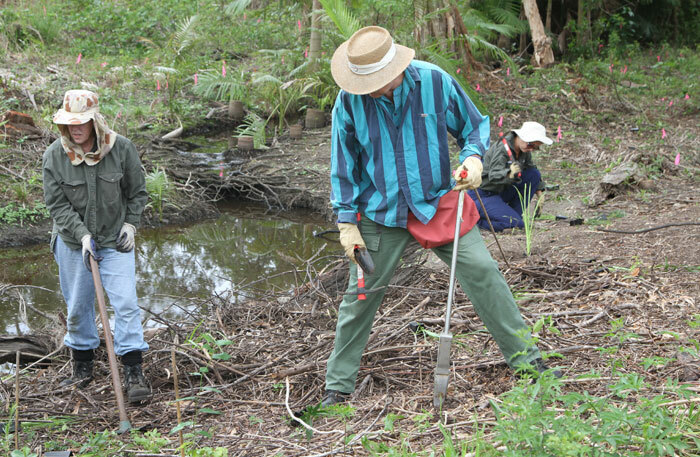 Dawn Road Reserve Bushcare’s Janet Mangan, volunteer Bob A and MBRC’s Nicole Byrne during revegetation of an embankment at the end of McConachie Court. 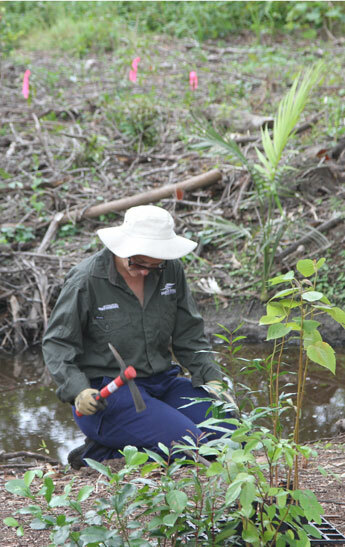 MBRC Bushcare officer Wendy Heath uses a special tool ahead of revegetation planting at the end of McConachie Court. DON’T you just love the bushland around our estates, peppered as it is with beautiful flora and interesting fauna? Even when it’s raining and the Albany Creek begins to babble, it’s a wonderful, diverse landscape. 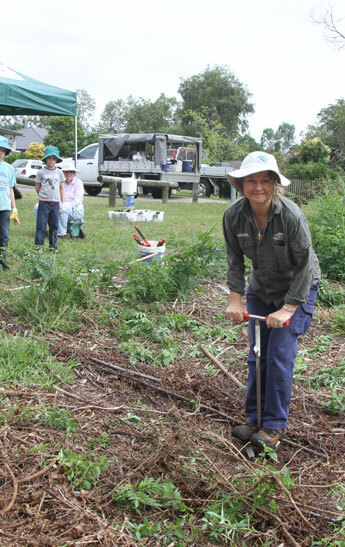 Well, one of the ways we can keep our bushland not only looking good but also free of invasive or destructive weeds (which could also spread to your garden), is to join in the fun, informative activities organised for our local Bushcare group. Our group is Dawn Road Reserve Bushcare (sometimes known as ‘the Weedeaters’) and our community leader is long-time local resident Janet Mangan. Our monthly working bee is overseen by the Moreton Bay Regional Council’s Bushcare officers Wendy Heath and Nicole Byrne. MBRC Bushcare officer Nicole Byrne prepares the ground for planting alongside a stream in the Dawn Road Reserve. We gather once a month, on the second Sunday, usually at 8am (although we start a bit earlier in the hottest months). The locations we work vary, depending on a program that’s organised by Wendy, Nicole and Janet, but all are within the bounds of the Dawn Road Reserve. All you need to do is turn up wearing a long-sleeved shirt, long trousers, sturdy closed shoes and a wide-brimmed hat or sun-safe cap.